A lone stoner explains how to get away with smoking weed in public. Smoking weed in public isn't a good idea—in fact, there's a reason it's a bit of a teenage bragging right. In the wrong part of the country, public marijuana use can easily get you jail time, job expulsion, and worse. Generally speaking, it's a bad risk to take and you shouldn't do it. That being said, there are plenty of people who try to learn how to get away with smoking weed in public. It's a risk people are willing to take, for one reason or another. The truth of the matter is that it's possible to get away with smoking weed in public in many situations. I ought to know. I've done it. That being said, there are some skills you need to know if you want to get away with marijuana use in public spaces. Here's how to get away with smoking weed in public, or at least reduce the risk of being arrested for public pot use. Smoke where it's legal to smoke. Before we talk about how to get away with smoking weed in public on an illegal level, it's absolutely crucial to talk about legality. The smartest way to get away with public cannabis usage is to live or be in a state where cannabis is legal. If you live in a cannabis-legal state, police are much, much less likely to arrest you for possession or using it in public. That being said, arrests can still happen depending on state laws. So, smoke publicly at your own risk. Don't be obvious or obnoxious about it. Back when I used to be a random party animal in New York City, a friend of mine, who we'll call Cletus, loved to show off his pot smoking tricks. One day, a police officer told him that he smelled pot on him. Typically, this would make people ask to pay the fine - but not my buddy. Cletus, trying to act macho in front of a girl he was trying to impress, whipped out a joint and blew a puff of smoke right in the officer's face. This is stuff you should never do. Cletus ended up going to jail, and only recently got out after about a year. The police officer also beat him up. It was not fun explaining what happened to his dad. So, the moral of that story is that you shouldn't be obnoxious about your pot smoking. On a similar note, smoking a joint while looking sketchy is a good way to get police to notice you and approach you. Don't be the kid in the baggy pants, hoodie, and sunglasses looking over his shoulder while he puffs a joint. If you can't relax, blend in, and look casual, don't smoke weed in public. It's asking for trouble. Sadly, no guide on how to get away with smoking weed in public will save you from having police approach you when you're acting like a tweaked, paranoid wreck. Most people who have been to a music festival can tell you that cigarette smoking can really cover up weed smoke efficiently. 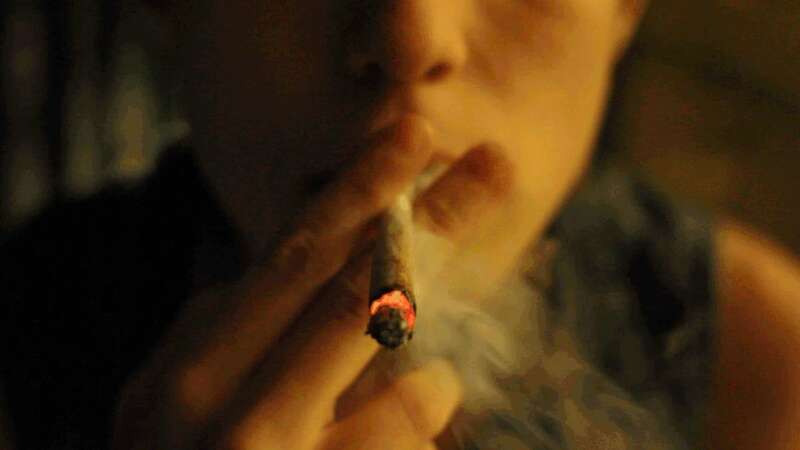 In many cases, cigarette smoke is stronger than weed smoke. The same can also be said for cigar smoke and clove smoke. So, the easiest way to mask the smell is to smoke weed around cigarette/cigar/clove smokers. Even so, you still should spray yourself down with perfume afterwards. While you might not be able to smell weed smoke on you when you're around smokers, more sensitive noses might still pick up on the aroma when you're solo. Realistically, crowds are your friend when you're trying to smoke weed in public. Additionally, the more marijuana users there are in a crowd, the less likely it is that you yourself will get caught. If you really want to be a chameleon about it (and you should), get joint wraps that look like cigarette rollers, such as Urban Wraps. This can help you buy time and make a clean break, should you see police coming near you. If you can, get out of sight. One of the easiest ways to enjoy weed publicly is to spend your time smoking as far away from everyone else as possible. There are many, many parts of America that are public - but not crowded. National parks, for example, can be hundreds or even thousands of acres in size. Cops are not going to be patrolling every single square inch of those parks. As a result, they make for a very easy venue to smoke weed in public without too much worry. If you're a local to your area, you know what public places tend to remain totally uncrowded and which places almost never have police patrolling them. Go there to smoke in public if you have to smoke in public. Use a vaporizer, a one-hitter, or a pre-rolled joint. Discretion, if you haven't noticed, is the name of the game. This also should apply to the smoking goods you're carrying. The smaller your smoking device, the better. Additionally, the less marijuana you have on you, the better. Should you get searched, keeping things as low key as possible will lessen the chances of you ending up with an arrest or even having the police discovering that you were carrying on you. The best bet on keeping things as low-key as possible is to carry smoking tools that disguise your marijuana use, such as a vape pen, a pre-rolled joint using Urban Wraps, or a one-hitter that looks like a cigarette. Above all, don't be the idiot who tries to smoke a bong in public. Even I, who spent years as a party animal pothead, have yet to see someone smoke a bong in public without getting arrested. Spray down your clothes afterwards. Police will still ask you to be searched if you reek like pot. This is why any article explaining how to get away with smoking weed in public emphasizes the importance if using perfume, body spray, or Febreze to get rid of the smell after you smoke. Discretion, once again, is key. Don't look or smell like a stoner, and you probably won't get approached by police. A little common sense goes a long, long way when it comes to getting away with smoking weed in public. Don't brag about it online—or at least, don't do it under your own name. Don't be the idiot who decides to look suspicious by wearing gangster-y clothing when they light up in public. Don't smoke in your car, because police will end up searching it the moment you roll down your window. Don't smoke near schools, because most states will penalize you two times over for that, thanks to "Drug Free School Zones." Seriously, this is common sense, people. Use your brain, and you will likely be alright.